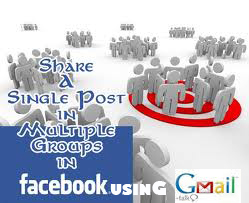 Now a days every facebook user want to share their post in multiple groups at once just in on click, if you want too then here is a trick to post in all FB groups with one click. As you know facebook is a good place for all of the bloggers to promote their blog posts and share their links on facebook fan pages and Facebook groups to boost their blog traffic, So for that purpose we joined a lot of groups. But how you sharing your posts/links to facebook groups? It will be very difficult to open every group then posting to each group individually. So here you need a trick to share/post your link/status to all FB groups in a single click. If you are looking for this trick that how to post to all FB groups in one click then here we are going to show you this trick. Top 10 websites to find Cover photos for your facebook timeline. You may also use some apps for that purpose or some online tools that available on internet like social media management tools, but here you will learn to share your post in all facebook groups using Gmail. 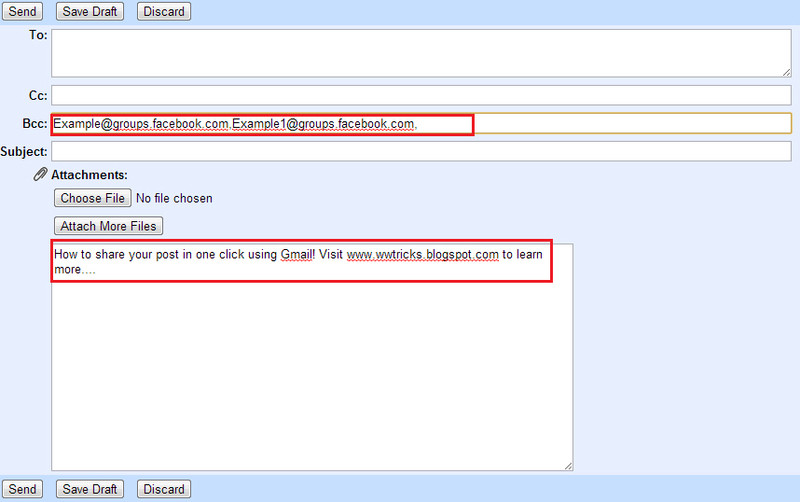 As you know we will use Gmail so first make sure that you created facebook profile with your Gmail account. If not then go to facebook account setting and add your Gmail Id. 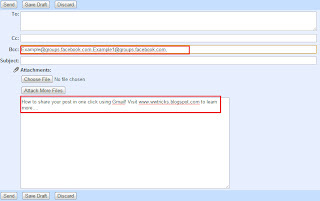 After adding Follow the below easy steps to share your post in all FB groups with one click. STEP-1: The first step you have to do is a bit difficult but not too. You need to collect Mail addresses of the groups that you joined. You can collect/find mail addresses of the groups you joined by these methods. 1) Going to a group and clicking on 'Info'. STEP-2: After collecting mail addresses for all groups save it in a safe place i.e paste it to notepad and save it as a text file. STEP-4: Finally click on send button. Now you shared your post in all FB Groups just with one click. Your post will be live in all groups you entered their mail addresses. Final words: So friends this was a simple and easy trick to share your post in all Facebook groups with a single click. Now it is upto you check this trick and share your post in all FB groups. If you are facing any problem using this trick then feel free to comment. If you like the post, then share it with your friends too on facebook or twitter. bhai ap nay use kiia hai kia .ap kindly mjay b guide karain gay kia??? Let me know where you're Facing problem? omg amazing tricks.Well done admin. Thanks its good to see this post, facebook is great source of traffic for me. Here is one site which I am using to post in all groups http://fbgroupshare.com/. Hope it helps you too. Hi amit! I glad to see you here. And thanks for sharing this website with us, it will be surely useful for me and readers. You can post a photo by uploading it as an attachments. Read the post again and do the same & test again. I hope this time you will be able to post a photo too as i tested it already. Hello ram bala! Thanks for bieng here! Images work fine for me. I don't know why this is not in your case. I will come soon with a video tutorial. You have to wait for it. I hope it will be easy to understand & you will be able to post in all fb groups easily. This is a very tedious process to add al the contacts. may be you are better of using an application for this. I found this app on google. It allows you to post to any number of groups you may want. Very Nice Basheer Ahmad!! I shall try this helpful trick!! Hello Adeem Ezaz, thanks for being here and appreciating our post. Keep visiting and commenting on this blog!!! Hi.. I heard that from few other readers too. but please you make sure that you uploaded the image as an attachments not by clicking on "Insert photo". I am sure this time you will see your image with your status while sharing your post in all facebook groups using gmail. If this worked for you then please come back with a comment:-) also do share this post with your friends! but in this it's possiable ? Thanks malik for being here! stay tuned with us!!! Thanks for appreciating & commenting! Hmm. I checked the trick for about 20 groups and found it working. I don't know why it allow you only for two 1,2 groups. Prasanth, I've another trick for you which is only in case if you're a blogger and want to share your blog post link to multiple facebook groups. 1. First, Add a facebook send button to your blog. 2. Click on it and type the names of groups, select one by one as appears as suggestion. You can see and test the send button as I have in my blog, see at the start of the post. I did a try, but seems does not work. Zeeshan Hassan Brother, thanks for your contact, I had sent you friend request on facebook, accept me so i'll show you the process of collecting groups mails and sharing posts on all of those at once. Hi Aerix, I glad to see you here at our blog and leaving your valuable comment. Its good for me that my post was helpful for you. Don't forget to share it with your maximum friends and let they also share their post on multiple facebook groups.